Your volleyball attacking should involve hitting the ball hard down the line, cross court, and hitting shots to all areas of the court. 1. Attack to get the opponent out of system. 2. Hit both at and off the block – don’t always avoid it. 3. Swing to the sidelines and endlines. 4. Use off-speed shots to open areas. 5. Wipe off the block on trap sets. Attacking to the court perimeters (sidelines and endline) creates real problems for defenders. Attacking the ball straight downward can be risky because you could get blocked or hit the ball into the net. All players want to score when they attack, but it’s also important to keep the opponent from running an effective offense. 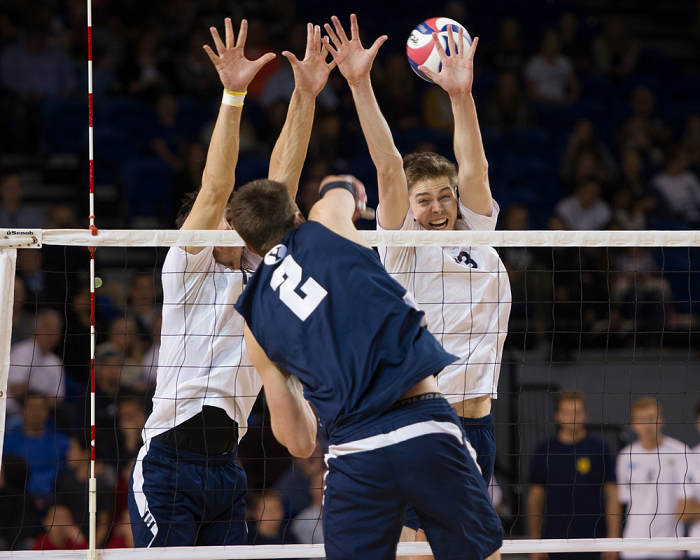 At almost all levels of volleyball, the majority of blocks are bad blocks. Most blockers are late, split, or don’t penetrate the net. The fact is, one of the most effective volleyball attacking strategies is to attack the block. Most attackers have the best chance to score by attacking the top, the edges, or the seam of the block. The most well-rounded attackers will use off-speed shots as part of their attacking strategy to keep the defense from setting up to dig a hard driven ball protecting the perimeter. Every player should have the ability to tip the ball or hit cut shots with intention. It’s important the arm swing looks similar with each type of attack. The decision to tip or roll the ball should be made just as the arm is coming forward so as to not give away the shot too early. For a tight set (trap set), the attacker should take a huge step toward the net. This move ensures the attacker can plant and jump straight up to avoid drifting into or landing under the net. The hitter can joust or tool the blocker. The “tool” is done by pressing the ball against the block and shoving it out of bounds. This move is also called a “wipe off” because the attacker is wiping the ball off the block. To win a joust, you want to be the last to PUSH the ball. Basically, hold the ball against the block, at the last second as you are coming down, push the ball so the ball comes down on the opponents side. The key is to keep the arm straight so you have more leverage on the opponent.